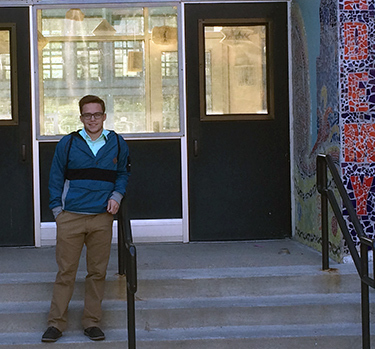 Mark Myers ’16 – Our week at Phillips Academy was exciting. Both of us had the chance to experience a new environment and Phillips is unique in its setup. Phillips used to have an honors floor, a boys floor, and a girls floor; however, they now just do gender separated classes with the exception of the honor classes which include both genders. I was with two freshman classes, one male and one female, and two sophomore honor classes. Needless to say, there were many personalities among the four classes. The best part of my experience was being able to develop personal relationships with the students like I had been there all year. Austin was in a biology classroom with an AP course, two honors courses and a regular biology course. I took over the AP course for the week and was able to take what I had learned in invertebrate biology this year at Wabash and pass on some information to the students. To do this I was even able to take the students outside to collect specimens and observe them in the classroom. The students really enjoyed this experience and it was equally enjoyable for myself. Part of the reason for coming to Chicago is to experience the urban setting and new cultures. By staying in the hostel where there are numerous people staying from all over the world we were able to make experience different cultural perspectives firsthand. One night, we had the pleasure to meet people from Germany, D.C., and China. We played ping pong with them and just sat around talking. It was awesome to not only experience the culture in our schools, but to be able to come back to the hostel and experience this even more was amazing. Our time in Chicago was developmental and fun. We both learned many things that we know will help us become better teachers, and more importantly, help us become better people with the great guidance both host teachers provided us. Nick Wheeler ‘ 16 – During my short time in Chicago and at Kenwood Academy I have had some unique learning experiences that would be hard to come by anywhere else. This trip has given me a confidence that I never thought was obtainable. Being able to get on a bus or a train and not be absolutely terrified is an amazing feeling. It has also been a fun experience to work my way through the city and build a sense of comfort where I know where I am going and exactly how to get there. Another mind-boggling experience that anyone who knows me well will never believe is that I have tried food from a few different cultures and actually enjoyed it. I have taken a few leaps of faith this week and tried Middle Eastern, Chinese, and Puerto Rican food. Although it has only been a week, this trip has begun to open me up to many new cultures and the urban way of life. My time in the classroom has also been a fun learning experience. I have learned different ways of communicating, reaching students, and how important these interactions really are to their lives and learning experience. My favorite part about my time at Kenwood Academy has been watching the students interact with each other and with their teachers. It is so clear when a teacher genuinely cares for a student and that care is then reciprocated with student commitment and learning. More specifically, I have observed and learned effective and unique ways of teaching Spanish to students. This experience has further motivated me and confirmed my desire to become a Spanish teacher. Everything that I have learned and experienced this week is helping to me to form my ideal future Spanish classroom. One teacher that I observed told me, “Every teacher has a concept of what their classroom should be like, and you have to find yours.” This advice already has me thinking and will undoubtedly stick with me for the rest of my life. Jason Wright ’16 – Being in a big city like Chicago has offered me an interesting perspective on the concept of the urban element in school life and in everyday feelings and interactions. I believe that that is the greatest asset to this program; having the opportunity to see for ourselves how things are different and how things are the same between urban environments like Chicago and small town environments like Crawfordsville. Probably the most noticeable difference is in the demographics. Chicago is a very diverse city, and it shows wherever you go, in or out of the schools. Traveling the different neighborhoods of Chicago gives one the sense of stepping into other cultures, and that just isn’t accessible in most places outside of the urban setting. So for some of us, this will be the only time, or one of only few times in which we get to experience that phenomenon. The Urban element also brings a unique energy into the schools. Everything in the city is upbeat, and the classroom is no exception. Kids are full of energy and they always have something to say. Kenwood students are a very involved bunch, and they’re enthusiastic about contributing to class. What doesn’t change is that good teachers abound who invest themselves into their work and their students, and they are committed to getting down to good, hard work. I’ve learned that good teachers are equally able to develop a solid plan and to be adaptive. 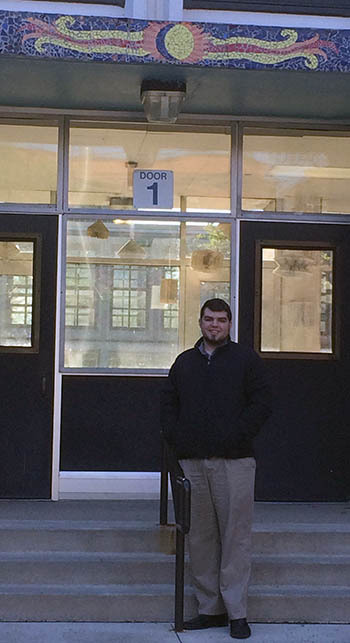 Grant Benefiel ’16 – When I first thought about teaching in Chicago, I was very nervous. I have seen movies and television shows that depict Chicago schools as dangerous and violent. With those first initial impressions, my view on Chicago was narrow. After my initial visit, my view on Chicago changed. I felt there were few differences between Kelly High School and my High School. Besides the fact that my high school contained mostly Caucasian students and Kelly High School contained mostly Hispanic and Asian students, there were few differences. I did notice that the students wore see-through backpacks and had to go through metal detectors before going to class. Security is a big deal at Kelly High School and they have kept the school safe and comfortable. After meeting my host teacher, I knew Kelly was special. I could tell the way my teacher would interact with the students that this was more than just school grounds. Kelly High School was home to many students. The teachers interacted with the students as if they were their own children. The teachers at Kelly High School care about their students. Our school is located in a Hispanic neighborhood. I have been able to safely travel around the neighborhood and eat at local restaurants. I can see that the school and community get along very well. While I was wearing my “student observer” name tag, one of the waitress proceeded to tell me that her son attended there and told me to make sure he was acting responsibly. Instances like that show me that the community and school have an incredible relationship. Being able to experience this immersion trip, I now have a better grasp of urban education. I have been shown how to care for students and to teach in an urban setting. I understand now the difficulties and complications that arise while teaching a school of over two-thousand students. I have also been taught what it means to be a community. Kelly High School and this immersion program have shown me the beautiful side of Chicago and urban education. Truman Jones ’16 – The final trip to Chicago was initially one of the more intimidating things I had ever been pushed into doing in my Wabash experience. Now a day trip with family or the trip to Chinatown for dinner was one thing, but staying for a full week in the city was daunting to say the least. But as the time approached I got less nervous, and after the day trip and meeting my host teacher for the first time, I was definitely less anxious to undergo the trip. 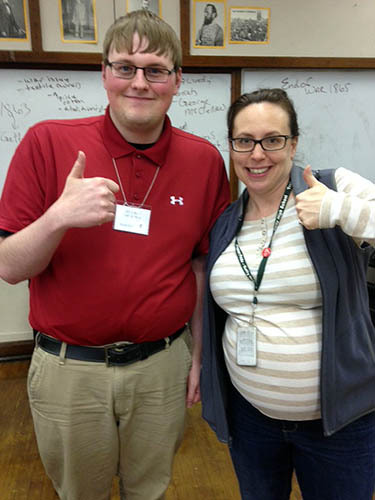 Truman Jones ’16 with his host teacher. Part of getting your teaching license in Indiana requires you to have at least three full days of teaching experience in an urban environment. I was placed at Kelly High School that is one the southern side of Chicago. Kelly High School has just over two thousand students, and is primarily Latino, with Asian ethnic backgrounds making up the next highest amount, with everything else in smaller numbers. Now this is much different than what I was used to, as the school at Crawfordsville I taught at was around a third of the size, it was also primarily white. So that has been the first real hurdle that I had to get used to be that I was no longer part of the majority, but suddenly put in the minority. But beyond that, the ideas that I had stuffed in my head about big city life, the urban school, and the people in it have been dashed. I have been welcomed with open arms. My host teacher: Mrs. Zamora, was just one of the friendly staff members at Kelly High School that helped me understand the unique challenges and opportunities that is required to teach in urban Chicago school. I thought that it would be uninterested students, and blank stares, but I found that students were active, excited, and willing to talk. They were eager to know more about me, and I am saddened that I am not staying for longer so I can better get to know them. In summary my experience has been that despite what anyone can tell you about Chicago, its schools, or its people, you can make any judgments unless you experience it for yourself. The city was/is not the most terrifying thing that exists in the world, the people are not rude and unhelpful, and the schools are not seedy and riddled with gang activity. I would say that stereotypes and ideas are meant to be broken, and thanks to my time at Wabash, I was able to experience it for myself. Alexander Hernández ’16 – Whittier Dual Language Academy, Benito Juarez, and Chicago are like no other places I have ever encountered because of the hidden novelties they contain. Even though both my formative education background resembles the ones that I see at Whittier and Benito Juarez, our differences extremely vary. During these past couple of days, I learned that visiting and immersing myself in Chicago was not the same thing. Hernandez, in Chicago, at right. If I had the option to switch my K-8 schools for Whittier, I would change it in a heartbeat. I would make this transition because the school was able to keep the humane aspect of learning English while polishing their Spanish, and vice-versa. Learning a language that is not an easy thing, especially when the language is an alien language to the family. Being able to help the student enforce the language they know at home, while creating a strong foundation for the new language is just plain amazing because this prevents the English Language Learner student from feeling displaced. The ability to learn about Cesar Chavez, or explore any other multicultural figure and event, were things I was starving for. Being able to see these kids get to know about their culture, and the cultures of the other, while analyzing through a Wabash lens at their age is just plain jaw dropping. Even though I have not been to Benito Juarez yet, I am looking forward for it because the high school environment brings a new set of uniqueness. I found it interesting that visiting and living in Chicago can be a totally different experience. I have been able to explore more the Latino while exposing myself to Middle Eastern and Chinese foods in the past two days have been heaven. My experiences with this course and my whole fieldwork have been just plain amazing thus far. Everyday has brought new lessons both academically and personally. I learned that is okay to be different because you have your own experiences, knowledge, and skills. I learned that teachers and students are able to finally connect with each other. I learned that no matter how different you are, you are just like any other on public transportation. Arturo E. Granados ’16 – People call it “The Windy City”; at least that’s what the tourists call it, I’ve never heard a native of Chicago refer to it that way. In fact, that might be the biggest indicator of a tourist; if they call this place by that name. As much as I hate to admit it though, we are pretty touristy. I find myself asking my classmates to take my picture in front of different monuments and statues, I am quite shameless and relish in the experience. We are here for the “Chicago experience,” and by golly we are getting it. We are taking the “L” Train to get around the city–to get to our class dinners, and most importantly, to get to our host schools. I admire the way that the educators genuinely care for the well-being of the students at the Institute. Having students from all types of backgrounds, there are students who are not as studious as others. That being said, these educators (from the Dean of Discipline, the Academic Advisor to the individual classroom teachers) do not seem to lower their expectations of anyone; they expect them to do the best work they can do and there is a sentiment of disappointment if they fail. But it is an environment that supports students who may be failing and tries to help them to do better. I’ve had a pretty good time so far on this trip. Like I said, I have been indulging my inner tourist. Yesterday a whole bunch of us went down to see the famous “Bean”. Like the conformist millennials we are, we proceeded to take pictures of it; indulging in the way that our reflections were so clearly represented on the giant monument. We were accompanied by a diverse group of people: Muslims in head dresses, sorority girls, Japanese girls with big white cameras, there was even a man who proposed to his woman right before we approached the bean, she was still crying and fanning herself with her newly engaged hand when we arrived. 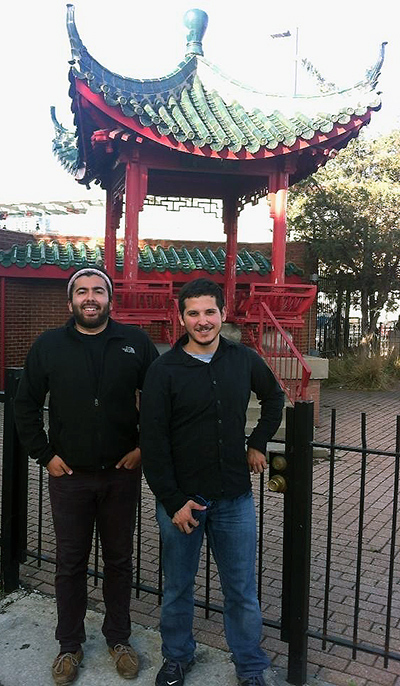 Today we all went to China Town to eat…Chinese food. It was a restaurant that was located more or less in the middle of the main street of China Town, the place is called Emperor’s Choice, if you ever want to drop in. After eating some of the best duck that I have ever tasted, Grant and I went strolling about searching for trinkets to bring back to our families and loved ones. I love shopping in China Town because you never know what you will find. All in all I am enjoying Chicago very much. There are still some things that surprise me, like finding a dead sewer rat on the sidewalk on the way to my school, but I try to take things one step at a time. Tomorrow I am planning to give my first lesson at De La Salle , so I’m pretty excited for that. Hopefully I have given you a good insight of what we have done so far on our trip! You’ll hear more from us soon!